This last week’s replay of hot topics included responses to Caitlyn Jenner’s coming out, including a move to strip Bruce Jenner of his Olympic gold medal and ESPN defending its decision to award Caitlyn the Arthur Ashe Courage Award. And who can keep up with the trials and tribulations of Brittney Griner and Glory Johnson Griner as well as the whole soccer scandal unveiling a level of corruption in soccer on a global scale that is hard to believe. All-in-all, quite a week! After Bruce Jenner’s much watched interview about his transitioning, the reception to Caitlyn Jenner’s new public identity has been primarily positive and supportive. However, Bruce Jenner’s comment during the 20/20 Interview that he always felt he was a woman has led to a petition to strip Jenner of his Olympic gold. Almost immediately after ESPN announced that at its upcoming ESPY awards, the Arthur Ashe Courage Award will be given to Caitlyn Jenner, there was a hue and cry raised that she wasn’t the most deserving person for that award. People named both 19-year-old Lauren Hill who raised money for brain cancer research while she was dying from an inoperable brain tumor, and Army veteran Noah Galloway who lost an arm and leg in an roadside bomb in Iraq and still competes in marathons, CrossFit events, the 58-hour Death Race and Dancing with the Stars, as being more worthy candidates for the courage award. WNBA star Brittney Griner of the Phoenix Mercury has filed for an annulment of her 28-day marriage to fellow athlete Glory Johnson-Griner. Saying that the marriage is based on “fraud and duress,” Griner says she was “pressured into marriage under duress by Johnson-Griner’s threatening statements.” This announcement came just one day after Johnson-Griner happily announced they’re expecting their first child together, TMZ reports (http://www.tmz.com/2015/06/05/brittney-griner-glory-johnson-annulment-divorce-marriage-wnba/). 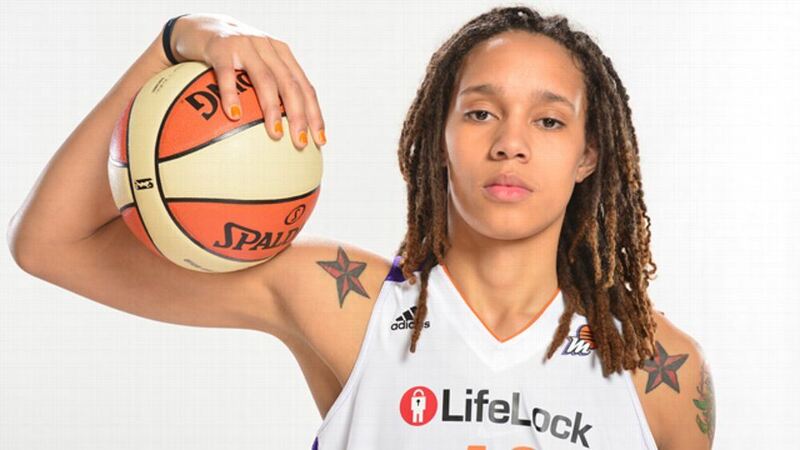 Johnson-Griner is carrying the child and will not be playing with the Tulsa Shock this season as a result. The two women, who appeared on a January episode of “Say Yes to the Dress: Atlanta,” got married just weeks ago. In April 2015, Griner and Johnson were arrested for allegedly assaulting each other and each given a seven-game suspension for their actions. But in a recent exclusive interview with Sports Illustrated, Johnson-Griner says she was the victim in the assault by Griner. According to medical records provided by Johnson-Griner’s lawyer, she suffered head trauma and a concussion as a result of the scuffle as well as spinal trauma (http://www.si.com/wnba/2015/06/01/glory-johnson-speaks-out-fight-brittney%20griner). Read the full story here: http://www.usmagazine.com/celebrity-news/news/brittney-griner-files-for-annulment-from-glory-johnson-after-28-days-201556. Gay soccer fans are set to see some great lesbian role models playing in FIFA’s Women’s World Cup Canada 2015 from June 6 through July 5. According to Outsports, there are 17 openly gay women on the various teams, including coach Jillian Ellis and players Ali Krieger, Megan Rapinoe and Abby Wambach from the U.S. team. This all seems to pale, however, in the face of the international scandal being investigated in FIFA, the International Federation of Association Football, soccer’s international governing body. It started in the U.S. when the FBI arrested American FIFA member Chuck Blazer of Queens on tax evasion and other charges. He pled guilty to corruption and then cut a deal with the FBI in 2011 to wear a wire to implicate others within the highest levels of FIFA.